Don't be jealous, but I'm going to Hawaii this summer!!! Do you know what the #1 dessert is in Hawaii? (Hint: It's not cupcakes) Snow Cones! Well, I don't know that for a fact, but come on, don't snow cones always remind you of Hawaii?! 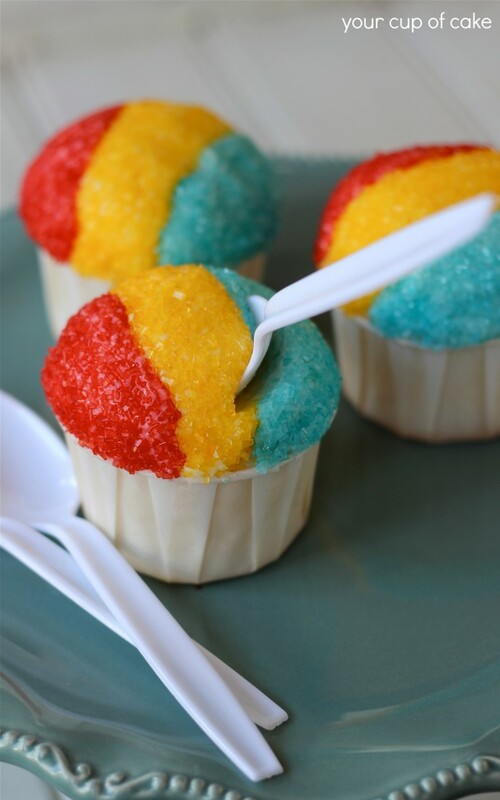 Your Cup of Cake posted a recipe for Snow Cone Cupcakes. They look exactly like snow cones, but are actually cupcakes! These special cupcakes are baked in souffle cups. Then they are topped with 3 different colors of frostings and rolled in sprinkles. Super cute! You can find the recipe and instructions here. Aloha!